This is a wonderful story populated with well-developed characters, and set in a historically rich place – the tiny town of Taylor\’s Crossing, Georgia. The fictional community\’s location is crucial to the story. We quickly learn that Taylor\’s Crossing is in northwest Georgia, near Taylor\’s Ridge, and south of Ringgold. Nestled into an arm of the Appalachians, in Chattooga County, it\’s an area rich in Native American and Civil War history. The story begins with Avie Williams Cole reluctantly flying back from her home in California, to settle her father\’s estate. Too busy to go along, her lawyer husband Michael has sent her off with their 13-year old asthmatic son Joseph to keep her company. As one might expect, Avie is having a difficult time processing her father\’s death. And it doesn\’t help that her relationship with Michael has recently become strained. Worse, he\’s been even more distant lately, as he\’s preparing for a big trial. We learn that he\’s promised to join them in Georgia soon, but as the story progresses, and Avie can only communicate with him by phone, she senses that he is slipping farther and farther away from them. From the dusty boxes of junk in the barn to the equally dusty relationships with her brother Griffin and half-sister Jolene, Avie has plenty of cleaning up to do. And it doesn\’t help that her Uncle Earl, who lives in town and somehow has a key to her father\’s house, keeps butting in and trying to intimidate her, as he had done when she was a child. To add to her homecoming confusion, there\’s a man named Will, a local teacher who seems to be a part of the Ridge itself. When Avie first meets him, she believes he is he is trespassing on her land. Though Will tells her he has her father\’s permission to be there…. Joseph soon becomes friends with a local boy of similar age, Tyler, who mother and son meet before breakfast their first morning back. Tyler\’s digging on their property, in search of a legendary lost Cherokee silver mine, and claims he too, has her father\’s permission to be on the property. Avie\’s not too happy that Tyler\’s leaving holes all over their land, but she can\’t deny that the story of the lost mine captures Joseph\’s imagination. Plus, she knows it will be nice for her son to have someone his own age to keep him company while she works to close the estate. 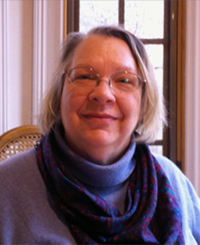 The next person the Coles meet is a woman named Xylia, owner of the local general store. Xylia is quite a character, and life in Taylor\’s Ridge seems to revolve around her and the store. Avie and Xylia quickly become friends and Avie soon realizes Xylia may be able to help her deal with her son\’s medical challenges, the loss of her father, and maybe even the frustrations of her marriage. Half-sister Jolene soon shows up as promised, to add to the mix of characters. She\’s a brassy women with soft heart and a babe on her hip; sort of the antithesis of Avie, which adds to the fun. Author Watts is an excellent writer, and the story is well-written. In fact, it\’s so carefully plotted and entertaining, you may find it hard to believe this is a first novel. I promise that you\’ll find yourself caring about Avie\’s struggles with her grief, her meddling relatives, her son\’s asthma and the fact that her life back home in California seems to be unraveling faster than she can tie up the estate. Will Avie learn to blossom and make new friends in Georgia? Will her marriage survive the distance? Will she decide to take her brother Griffith\’s advice to turn the land into a new home subdivision, or figure out a way to hold onto it as is? Is there really an ancient silver mine on her property? And what will become of the brassy Jolene, meddling Uncle Earl and Aunt Cottie; not to mention Xylia and Will? I don\’t want to spoil the fun – but you\’ll find have to read the book to get those answers. 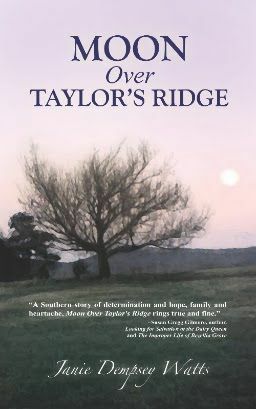 Just published this month, Moon Over Taylor\’s Ridge is available at your local independent bookstore, or online at Amazon and Barnes & Noble. Nook and Kindle editions are also available. And, if you live near Ringgold, Georgia, author Watts assures me you can pick up an autographed copy at Mizz Kim\’s Creations.